Dinuguan is the Filipino version of blood stew. Pork slices are sautéed in onion and garlic and cooked with pork blood. Sometimes, pork innards such as the small and large intestines along with other internal parts of the pig are added. Start by sautéing garlic and onion. This is a common practice when cooking Filipino dishes. Make sure that the onion softens before adding the pork. Saute the meat until it turns light brown. This recipe suggest the use of any boneless cut of pork. Cook it until it turns light brown. Feel free to add innards. Check this recipe and use it as a guide. Tenderize the pork by boiling. Pour water, cover the pot, and cook in low heat until tender. Adding a piece of pork cube (bouillon) is a big help to make the dish taste meatier. Pour the pork blood while stirring and cook it for at least 8 minutes to make sure that it is fully done. Add vinegar and the remaining ingredients. Some people would add vinegar before the blood. It is up to you to choose the sequence. You will notice that brown sugar is one of the key ingredients in this version. This is not a substitute for MSG as I would say in my other videos. It is added to help improve the overall taste of the stew. Season with salt and pepper. 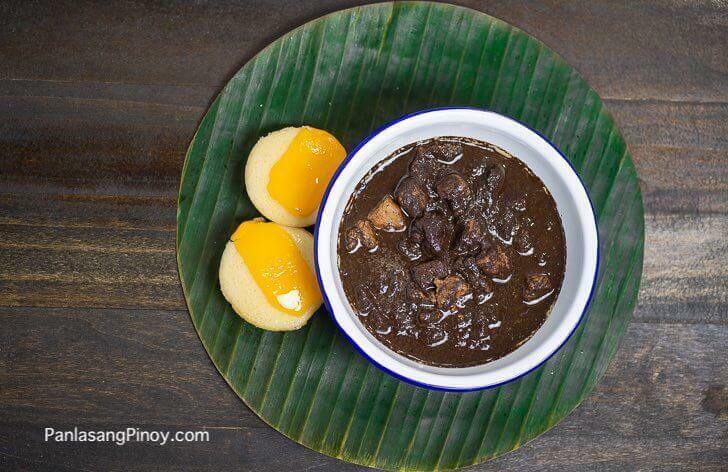 Dinuguan can be enjoyed with rice or with puto. Check out this recipe for butter puto. Try this Dinuguan Recipe and let me know what you think. Pork sauteed in onion and garlic and cooked with pork blood. This Filipino version of blood stew is something to try by adventurous eaters. Heat oil in a pan. Sauté garlic and onion. Once the onion softens, add pork. Continue to sauté for 5 minutes or until light brown. Add pork cube. Cook in low heat until the meat tenderizes. Add pork blood. Stir. Cook for 8 to 10 minutes while stirring. Pour vinegar and add sugar and long green pepper. Cook for 12 to 15 minutes. Season with salt and pepper as needed. Serve hot with puto. My name is Malou and I tried some of your recipe and I love it.I also reccomend it to my friends to visit your website, because they love your recipes.Anyway, I am just wondering if you know how to make sticky rice na binalot sa banana leave.Kc I know na isa yan sa mga tradistional sa atin.Thank you and mabuhay po kayo at ang iyong pamilya. Thank you Mary. Really appreciate your effort of making this site known. Please continue spreading the word. Did you mean suman? Not a problem. It’ll be more tasty if you’ll add some Bay leaf to this recipe. hi , happy new year to you. i would like to ask where can i buy pork blood in canada. is frozen blood okay to use? Thanks Elmer. Glad you liked our humble blog. It’s been a long time since I ate honecooked dinuguan as I do not know how the mixture goes. Our help before just mixed it ti her taste and now she’s married and were left with juts memories. Now -- we are ready to try again. thanks for the very detailed description of your cooking. it gives us the confidence to do it on our own. I will blog next week when I’ved tried it. meantine -- be safe! hello kuya ,di po ba lalagyan ng asin ang dinuguan? I look forward to making your chicken pochero next weekend. di po ba lalagyan ng asin ang dinuguan? When I was little I used to love eating this that was because people would tell me that it is chocolate meat, but as I grew older and found out it was blood that we were eating I stopped from eating it. But I want to learn to cook it. i really love eating dinuguan, but since i worked here in Jeddah, never nako nakakain ng dinuguan. i would like to ask, is there other way of cooking dinuguan without the pork? any alternative recipe sir? I didn’t expect that cooking Filipino food can be easy, thanks to you. You make it so simple and fun yet true to the taste. I know how to cook basic Filipino food like adobo and sinigang but that ever since I discovered your site, I always ask my husband to challenge me to cook something new. I’m a huge fan! I love Dinuguan but I only eat the ones prepared by family and really close friends. Sometimes, I eat at Goldilocks and Kanin Club’s Crispy Dinuguan when I crave for it. At 7:00 this morning, I went to Farmers’ Market in Cubao to purchase some fruits and veggies. Suddenly, I just craved for Dinuguan so bought pork and pork’s blood so I can experiment at home. I have not cooked this ever, since I’m more of pasta, baked fish and salad eater. I was looking for Dinuguan’s recipe and cooking directions. I opened several sites but the ones that I love most is your version. I am about to cook the Dinuguan shortly. Thanks for sharing your recipe. The video is very helpful. Thanks po. I am not familiar with “long green pepper” and a google search did not give me consistent results. It looks like a serrano pepper. Is it that or is there another name for it? Hi Vanjo am so grateful that there’s a video now on how to cook every dish that we’d like to eat particularly your amazing recipes. I regularly checked all your recipes and so glad I know how to cook now especially Kare Kare, paksiw na pata etc. Tnx much and God bless!